Image caption Newly elected Speaker Henry Ramos Allup said: "Here and now, things will change." Venezuela's Supreme Court has ruled all actions of the opposition-held National Assembly are void until three banned members are removed from office. The decision comes after the assembly swore in the three opposition members, who had been suspended by the court. The court said the ruling applied to all acts that have been taken or will be taken by the current assembly. The move is likely to escalate the political turmoil gripping the crisis-hit country. 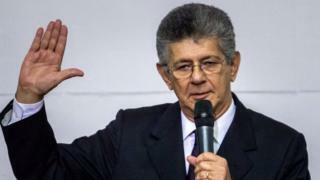 Four lawmakers were barred by the Supreme Court - three from the opposition and one allied with the government - after the Socialist Party alleged irregularities during last month's vote for a new congress. The opposition claimed the the ruling was designed to strip it of a so-called "super-majority" in the assembly and swore in the three barred members. The supermajority gives the opposition extra powers such as removing judges from the top court. That prompted the court to retaliate by declaring the assembly's decisions void. It said in a statement: "Decisions taken or to be taken by the National Assembly while these citizens are incorporated will be absolutely null." The four legislators are all from the rural and sparsely populated southwestern state of Amazonas. "The logical, sane and democratic step is for the National Assembly's leadership to revoke the swearing-in of these lawmakers," said the Socialist Party deputy leader and former National Assembly President Diosdado Cabello. "If the National Assembly is in contempt, nobody is going to recognize it," he said. The legislature was to sit on Tuesday, and the opposition bloc was planning to table an amnesty law for jailed activists, and government legislators intended to propose a declaration of "national emergency" over the economic crisis. Venezuela's Supreme Court has almost always ruled in favour of the government during the last 17 years of socialist rule under President Nicolas Maduro and his predecessor, Hugo Chavez.